A COSMIC coincidence could be the first clue to the origin of a high-energy neutrino spotted in Antarctica – and may help pinpoint the source of high-energy cosmic rays that bombard Earth’s atmosphere. Cosmic rays are massive charged particles that barrel through deep space with energies that dwarf those achieved at particle accelerators on Earth. Some may be accelerated to such high speeds by supernovas, but others have mysterious roots. “The origin of cosmic rays is one of the most intriguing questions in astrophysics,” says Toshihiro Fujii at the University of Chicago. But because they can be deflected by magnetic fields, their sources are difficult to trace. On the other hand, chargeless and nearly massless particles called neutrinos – a by-product of the processes that create cosmic rays – go direct, travelling in a straight line to Earth from their source. This directness could make neutrinos the key to solving the cosmic ray puzzle. Now astronomers may have observations to prove it. A new study reports a connection between a gigantic burst of energy at the core of the Milky Way and neutrino strikes on Earth. Amy Barger at the University of Wisconsin-Madison and her colleagues note that on 9 February 2012, the Chandra space telescope saw a spike in X-ray emissions from the centre of our galaxy, where a supermassive black hole is thought to be surrounded by a maelstrom of particles. Three hours later – just long enough for some of those particles to have decayed into neutrinos – an array of sensors buried in Antarctic ice, called IceCube, saw one of the highest-energy neutrinos ever detected coming from the direction of the galactic centre (Physical Review D, doi.org/v3p). This coincidence suggests that this neutrino, and probably lots more, was produced near the centre of the galaxy. If future observations confirm that neutrinos are accelerated to high energies by activity at the galactic centre, the same source could explain high-energy cosmic rays – although it’s still unclear exactly how the accelerator works. Measuring the full range of energies of similar neutrinos will help calculate the power of the accelerator that kicked them across the galaxy. “We are not immediately going to be able to say what’s going on there, but it’s the first step to doing that,” says Anchordoqui. Meanwhile, other observations suggest cosmic rays may come from even further afield. In August, Fujii and his colleagues observed correlations between cosmic rays detected at The Telescope Array in Utah and other neutrinos spotted at IceCube. The source, based on their paths, seemed to be outside the galaxy. 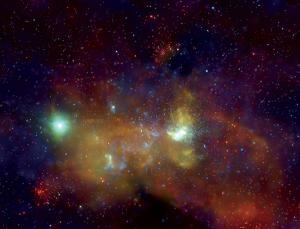 This entry was posted in ASTRONOMY, ASTROPHYSICS and tagged cosmic rays, neutrinos. Bookmark the permalink.